When it comes to land-based casinos in the United Kingdom gamblers are spoilt for choice. Fully licensed casinos are found not only in major cities such as London, Manchester, and Glasgow, but in a large number of other cities and smaller towns around the country too including the likes of Bristol, Bradford, and Leith. Grosvenor and Genting are the two biggest operators with 93 casinos between them, with other operators such as Napoleon’s, Aspers, Rainbow, and a number of independent casinos taking the total tally in the UK to more than 130. 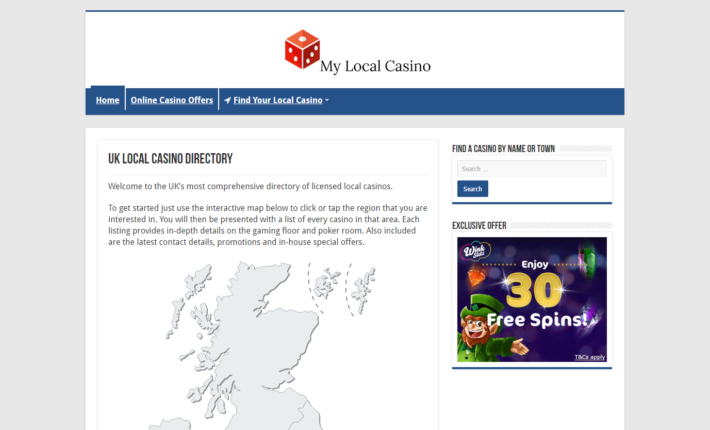 For directions to your local casino, or to read reviews before you arrive you can use the following directory. Gambling is of course, the first thing that pops to mind when thinking of a casino. Most local casinos will offer at the very minimum blackjack, roulette, poker cash games such as Texas’ Hold’ Em, slots, and electronic roulette. The majority of casinos will also provide the ability to play additional games such as 3 Card Poker and Baccarat, plus they will hold poker tournaments which often take place daily in dedicated card rooms. Entertainment might be limited to just gambling when playing at an online casino, but when you visit a land based casino you will soon discover that there is plenty more to see, eat, and do. Practically every casino in the country has its own bar that offers a huge choice of beers, wines, cocktails and light bites. In this area, you will find comfortable seating and high-definition screens that broadcast all of the latest football, rugby, racing, and mixed martial arts. It is not uncommon to for casinos to have their own dedicated sports bars or gaming lounges which have sofa’s, multiple screens, surround sound, and even fun interactive games such as those found on Xbox Kinect. Recently the larger establishments have been introducing special rooms that are known as “show bars”. These stunning rooms seat between 100 – 200 guests, have their own bar and feature a stage that is home to weekly entertainment from some of the UK’s biggest names, tribute bands, and comedians. These rooms are also perfect for private hire for special events such as stag parties, hen dos, and corporate events. When it comes to dining your local casino will offer some of the best cuisine around, in fact, some casinos even have their own in-house restaurant that are hugely popular in their own right. The Grosvenor Grill serves fantastic grilled dishes such as Ribeye, Sirloin, and Salmon Steaks. Genting’s offering is known as the Fahrenheit Restaurant which offers a great choice of starters, mains that include Chicken Forestiere, Gammon Steak, and Seared Seabass, plus mouth-watering desserts such as Chocolate Fudge Cake and Crème Brûlée. Casinos are no longer places that only appeal to those who wish to gamble money, instead, they have become a strong contender for most of the population when choosing a destination for a night out. The reason behind this is that land based casinos offer a mix of gambling, dining, and entertainment, that simply no other venue can provide. Bingola started up in 2014, the name itself being a nice play on words with the European name for bingo Tombola crossed with Bingo. The site is powered by Cassava and part of the Ignite Bingo network. 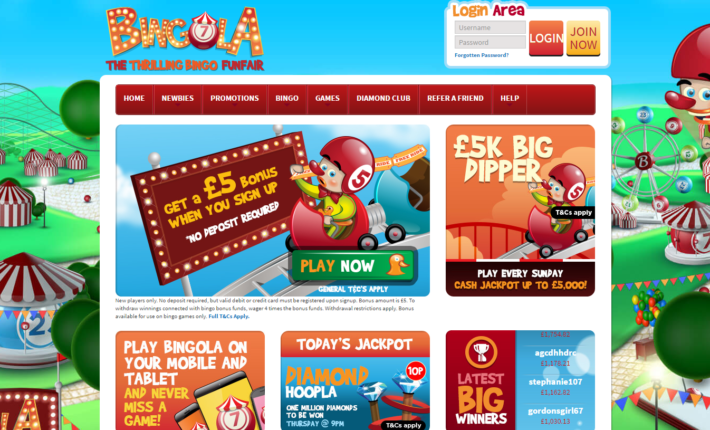 The name may seem unfamiliar but they have some other top sites on their network including Costa Bingo and Sing Bingo. Bingola is themed as a fun fair, with bingo balls hidden around the background, you can spot one taking up the roundabout, as well as bingo ball themed bumper cars! Bingola even has its own clown wearing a bingo ball hat who will help show you around, he will even give you a nice bonus to get you started! Sign up today and verify a valid debit or credit card and you will receive £5 free to taste the delights that this fair offers. Once you are satisfied then can grab a thrilling 200% bonus when you make your first deposit. Theres two promo codes here that shouldn’t be missed! When you make your second deposit you can get a 150% bonus just for entering the code NEW1 when you top up your account which is valid for up to £150 of extra funds. The fun doesn’t even stop there. On your third deposit use NEW2 and you will get an additional 100%! Bingola does not offer a dedicated app but that won’t stop you visiting this thrilling fair whenever you maybe. Just pop the address into a browser, register an account or login with your existing details and away you go! The games are of course funfair themed too, with 90, 75 and 5 line game types available to play across a number of rooms, each with their own prizes and ticket prices. Progressive and guaranteed jackpots can be played here, the promotions tab will give you the full details. Don’t forget the free bingo, it’s available to all players with real prizes on the line and no strings attached. Much like the side stalls at a fair, you will find side attractions at Bingola. These come in the form of some casino, scratch and great slot titles such as Lost Island. Phone – 0800 901 2462.